Colourful: St Stephen’s Cathedral façade will come alive with a kaleidoscope of colour and digitally animated storytelling. HISTORIC St Stephen’s Cathedral is set to become the new centrepiece of Christmas celebrations in Brisbane, with a free light and sound spectacular each night the last two weeks of Advent. People of all ages are expected to gather on the grassed courtyard outside the cathedral to witness “Lights of Christmas”, a visually exciting multi-media show projected onto St Stephen’s Cathedral sandstone walls and St Stephen’s Chapel. “In the heart of the city is this gem called the Cathedral of St Stephen that is a place of worship for many, and the Lights of Christmas is one more way in which we welcome and introduce people to the cathedral,” St Stephen’s Cathedral dean Fr Peter Brannelly said. 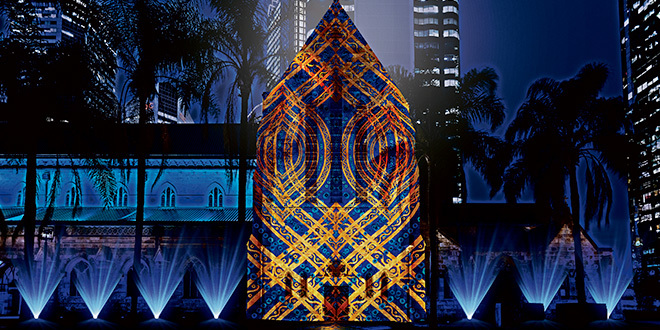 Presented by the Archdiocese of Brisbane and with major sponsorship from property group Charter Hall, the show runs for 12 minutes and will be split into three segments, starting with a kaleidoscope of colour moving across the cathedral exterior, inspired by the beauty and craftsmanship of the building’s stained-glass windows and terrazzo mosaics. The second segment will feature a digitally animated story written and narrated by Simon Pryce, best known to family audiences as the Red Wiggle. The story explores the power of giving rather than receiving through the character Roger Robot who feels overlooked for new toys gifted at Christmas and sets out on a journey to make friends, share love and help others through the gift of giving – ending in a happy Christmas Day for all. A traditional series of Madonna and Child artworks will round out the show with symbolic references to how both are guiding lights to mankind. “Hopefully it will become a family tradition and in our secular world it is a reminder of the sacred that is Christmas,” Fr Brannelly said. The show draws inspiration from a much-loved event at St Mary’s Cathedral in Sydney since 2010, providing an opportunity for Sydney-siders to gather together as family and friends in a public space and celebrate. The Sydney event continues to grow, hosting a crowd of more than 750,000 during Christmas season 2017. “Lights of Christmas” is created by AGB events and presented by Charter Hall with support from the Australian Catholic University, Catholic Super, Catholic Church Insurance, St Vincent’s Care Services and the Queensland Government. Fr Brannelly said cathedral precinct staff had put many months into creating and planning the event, with security and workplace safety concerns closely addressed. “Lights of Christmas” will run each night from 7.30pm to midnight beginning on December 12 until Christmas Eve.